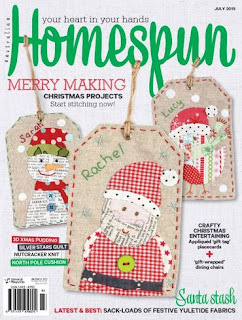 Rachel and I were extremely excited to receive the July 2015 issue of Homespun magazine. We knew that we had another project in the issue but had no idea that we would be on the cover..... so exciting!!! How cute is the cover??? Homespun always do such a great job. Our challenge was to make Christmas chair covers that looked like presents. We made two each plus four gift tags. Three of the tags are on the cover. We think the project looked good in the end. It was a bit of a challenge thinking of how to make the bows look good and still make the project, easy enough to follow. The magazine came out this week in Australia and also comes as a digital copy from Zinio. Loved seeing your project in Homespun and I think the tags look great on the chair covers. Thanks Karen for the lovely feedback.